Mozart’s Magic Flute may be a “timeless masterpiece,” an “immortal classic” full of music that will last forever. It’s also very specifically a child of 1791. Everything about this opera—its plot, characters, world, range of musical styles, and themes—makes much more sense when considered in its historical context. Musically, The Magic Flute is hugely significant as the first great Zauberoper, the German tradition of popular musical theater on fantasy subjects that eventually gives us such operas as Wagner’s Ring. In terms of the visual arts, it sits on the fulcrum between eighteenth-century neo-classicism and nineteenth-century Romanticism. Images from productions of this opera in its first few decades illustrate how Romantic art emerged from neo-classicism. 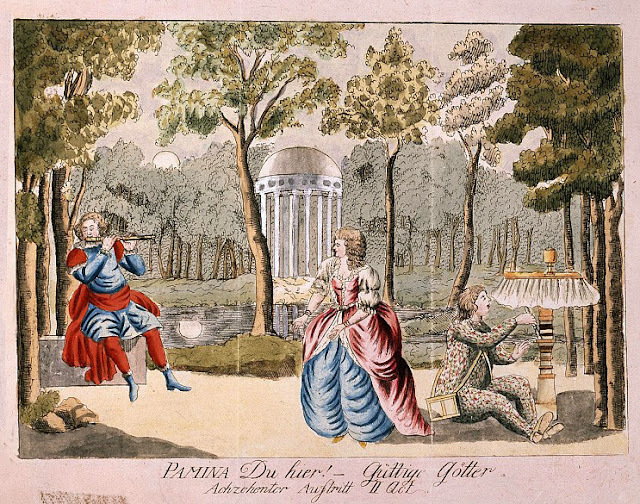 Mozart’s pal Emanuel Schikaneder, who wrote Flute’s libretto and created the role of Papageno, ran a ramshackle theater on the outskirts of Vienna that played for a popular, suburban audience. It was the antithesis of the royal theater, where the Vienna premieres of Marriage of Figaro, Don Giovanni, and Così fan tutte hadn’t been particularly successful. A pair of brothers, Joseph and Peter Schaffer, published engravings based on the very first visual realization of the opera, one which is a long way from the aesthetics of Romanticism. “Here, lovely ladies, let me give you my birds!” Tamino, the Three Ladies, and Papageno in the first scene. Notice how the ladies have chopped up the “Don’t Tread On Me” serpent that was threatening Tamino; an early interpretation posited that the ladies represent religion (Judaism, Christianity, and Islam, or else three branches of Christianity) and the serpent symbolized new-fangled Enlightenment ideals, such as Freemasonry. The temple at the back would have been painted on canvas; the rocks would be wing units. Engraving by Joseph and Peter Schaffer. “Blessed flute, your music brings joy even to the wild beasts!” Costumes for people playing animals have obviously improved greatly since the late eighteenth century! But at least Schikaneder et. al. seem to have added some birds, presumably descending from the fly loft. Gluck ommitted this scene—“Orpheus uses music to charm the wild beasts”—from his highly serious Orpheus opera, written when Mozart was a kid. Engraving by Joseph and Peter Schaffer. 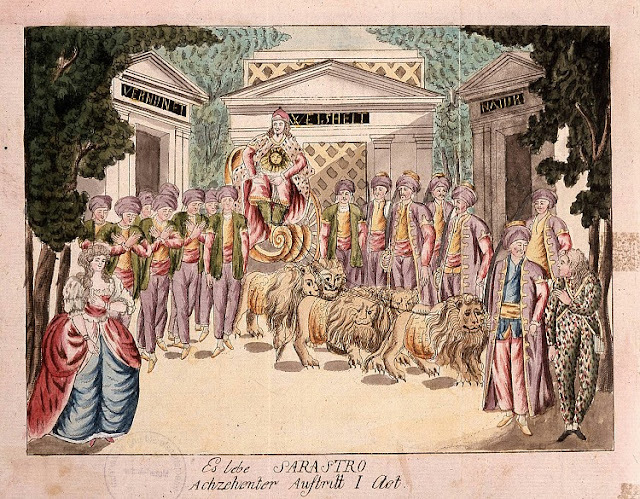 “Long live Sarastro!” The stage directions call for Sarastro to make his first entrance in a chariot drawn by six lions, which (like his totemic sun-circle) identify him with the sun. It’s hard to say exactly how that was done in 1791; most modern productions omit the lions. Notice that the chorus are in “Turkish” dress, although Pamina looks fashionably European. Engraving by Joseph and Peter Schaffer. “Tamino, won’t you speak to your Pamina? Don’t you love me anymore?” Act 2 Scene 18 played against a canvas drop with an uncanny resemblance to the Cambridge, MA tomb of Mary Baker Eddy. The advantage of canvas drops, of course, is that scene changes (and there are loads of them in The Magic Flute) can be instantaneous. Engraving by Joseph and Peter Schaffer. “Away with you, young woman! 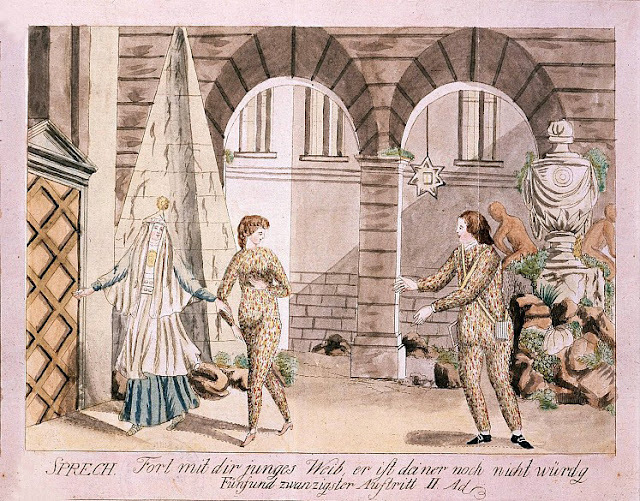 Papageno is not yet worthy!” This (canvas drop) set for a moment from the Act Two trial sequence includes Masonic elements—pyramid, arches, shining star, large urn—that also feature in an image printed with the Magic Flute libretto, as supplied to audiences at Schikaneder’s theater in 1791. Engraving by Joseph and Peter Schaffer. “Here are the gates of terror, threatening pain and death.” Tamino, Pamina, and the Two Armored Men sing their quartet before a canvas drop representing the Trials by Fire and Water. The tablet upstage center presumably carries the text read by the Two Armored Men at the beginning of the scene (“He who walks this most difficult of paths...”). Engraving by Joseph and Peter Schaffer. Scenic designs survive for an early Magic Flute production in the deep-perspective architectural style of Italian Baroque theater. A few families dominated this tradition; thus, names such as Sormani (creator of Seattle Opera’s old Tosca scenery) and Quaglio come up again and again. 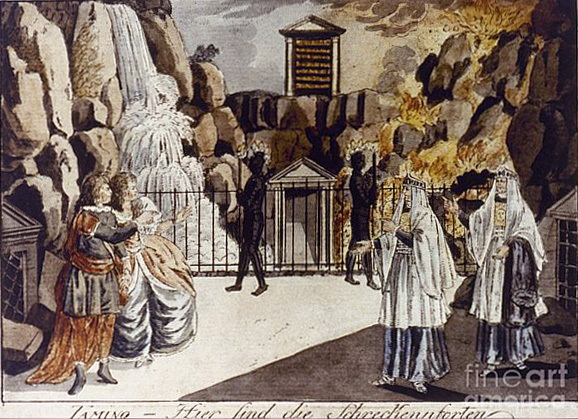 Lorenzo Quaglio created the sets for the world premiere of Mozart’s Idomeneo in 1781. Ten years later, his son Joseph Quaglio’s designs gave The Magic Flute a bit more grandiosity and dignity than may have been the style at Schikaneder’s theater, even if they don’t look much farther than Venice for exotic effect. 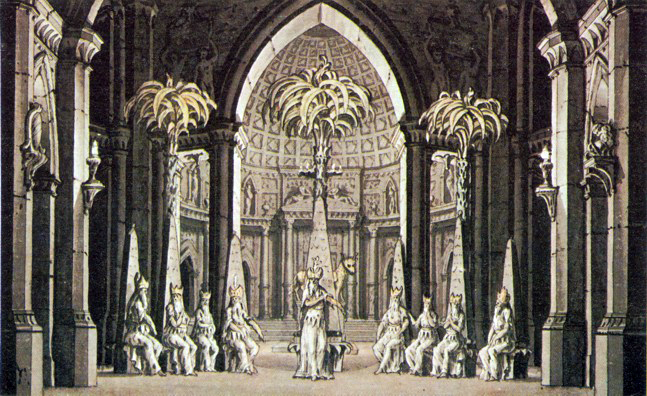 “If you deem Tamino worthy, follow my example.” This impressive Gothic cathedral/Pantheon with palm trees seems to be the meeting room for Sarastro and the priests at the beginning of Act Two. Design by Joseph Quaglio. Presumably the scene in Act Two when the Three Spirits bring Tamino and Papageno flute, bells, and a meal, midway through their trials. The scene would involve a deus ex machina (a popular solution to the entrances of the Spirits) and a canvas drop—but one which, in this case, eschewed symmetry for this wonderfully skewed perspective on arcades in Sarastro’s campus. Design by Joseph Quaglio. The Deadly Trials by Fire and Water. Quaglio may have used a ground row instead of a canvas drop, giving this scene more dimensionality. Design by Joseph Quaglio. German painter Karl Friedrich Schinkel was so blown away by “Wanderer above the Sea of Fog,” the 1818 masterpiece of German romantic painting by Caspar David Friedrich, he gave up painting and turned to architecture. Several of his buildings survive in present-day Berlin. 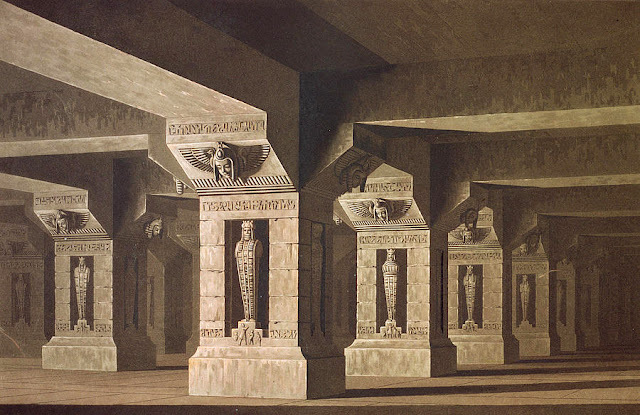 He designed 32 different theatrical productions; although he never abandoned Baroque principals of geometrical depth and architectural symmetry, his early Romantic images evoke rich moods, atmospheres, and emotions. His 1816 designs for The Magic Flute include some of the most influential images in the history of opera. The Berlin Staatsoper created a new production of The Magic Flute based on Schinkel’s designs in 1994. The Queen of the Night’s palace. 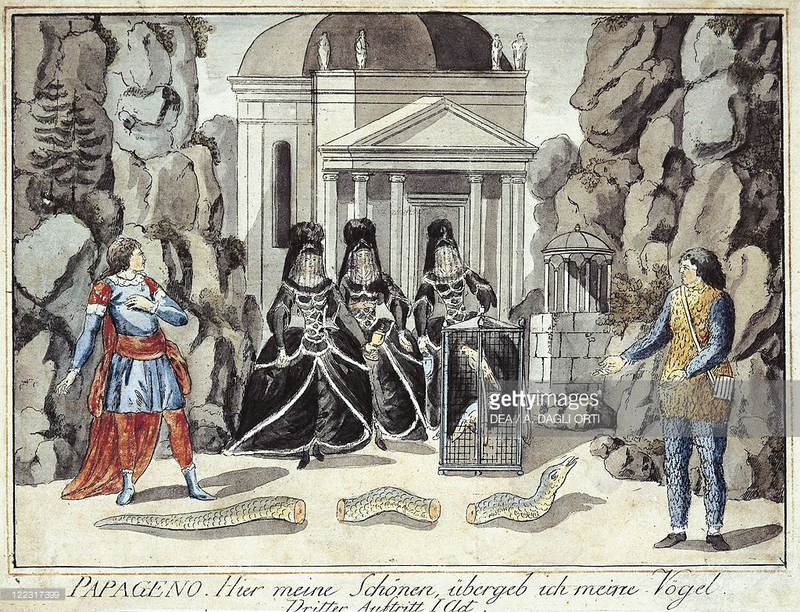 The snake pursues Tamino to this location, and when the Queen enters, it’s as if the Ladies have taken Tamino through the rocky arch and the building to where the star-drop beckons at the back. Design by Karl Friedrich Schinkel. The Queen of the Night sends Tamino on his quest. The Queen made a deus ex machina entrance on her little crescent moon, then flew away while the audience was applauding her wild coloratura. Design by Karl Friedrich Schinkel. Papageno comes upon Pamina in this part of Sarastro’s compound, and it’s here the two sing their charming duet, “Bei Männern.” Her captivity is obviously not TOO oppressive, and the natural area beckoning upstage indicates the optimism of these young people. 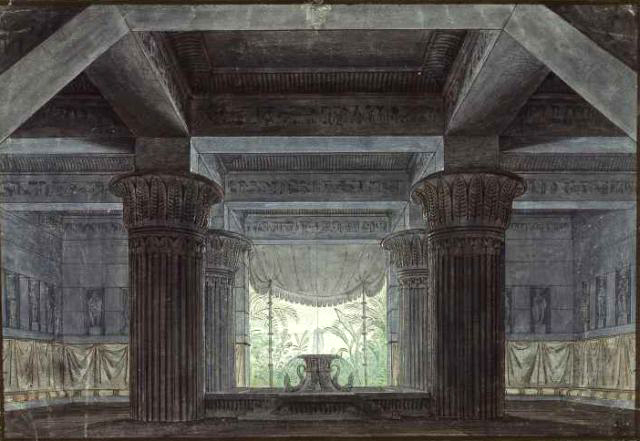 Design by Karl Friedrich Schinkel. 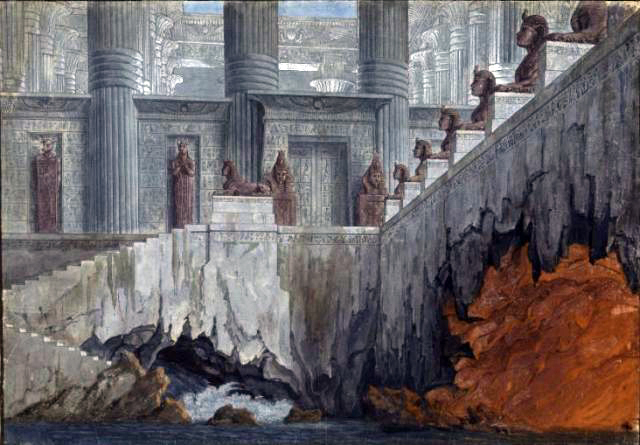 Meanwhile, the Three Spirits guide Tamino to this location, the entrance to the temples of Labor, Wisdom, and Art, where he encounters the Speaker. 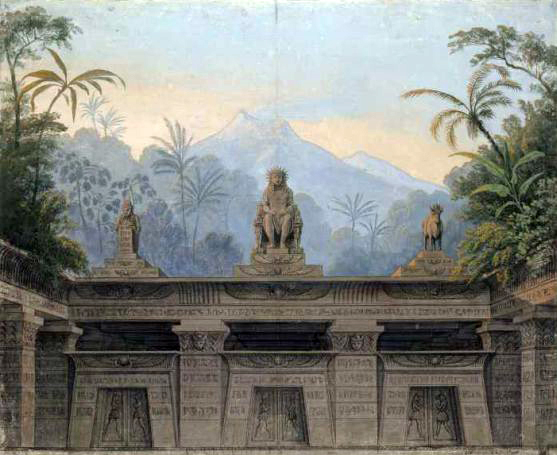 Design by Karl Friedrich Schinkel. 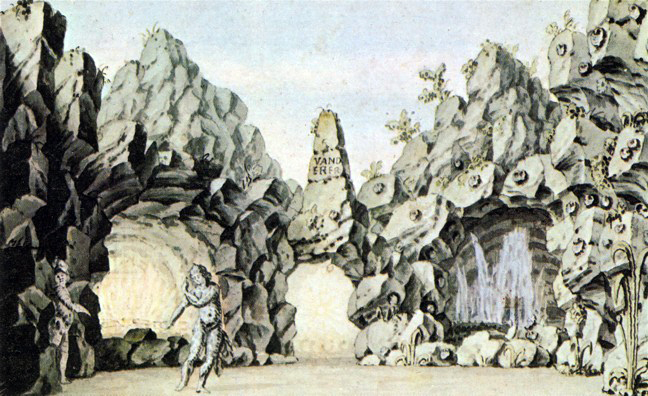 The Queen of the Night sings “Der Hölle Rache” to Pamina in this evocative location, “Sarastro’s Garden,” which looks like it might do double-duty as set for Aida’s Nile Scene. 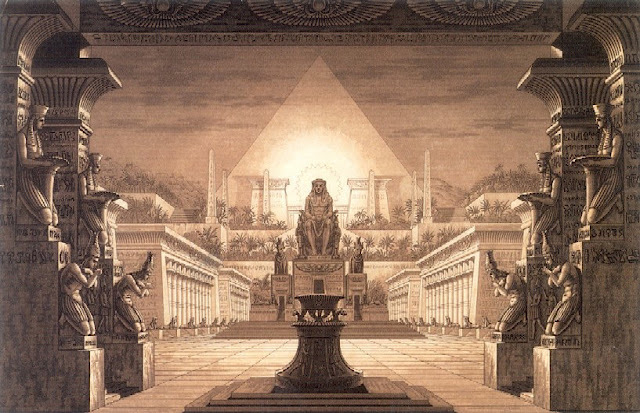 Design by Karl Friedrich Schinkel. “Man! You have earned an eternity of wandering through gloomy caves.” The hapless Papageno sings “Ein Mädchen oder Weibchen” here, in Sarastro’s spooky mausoleum. 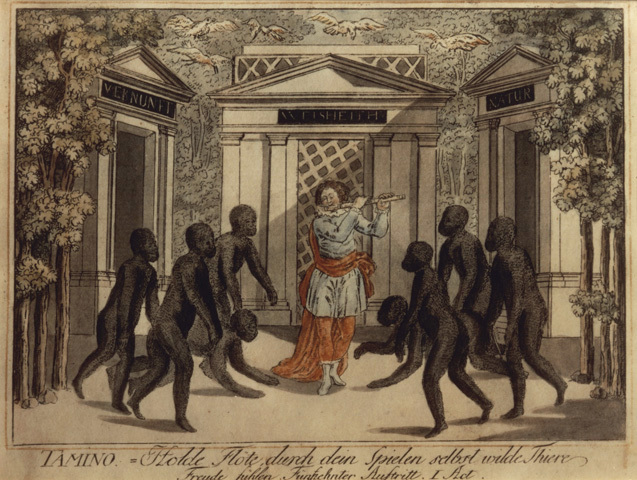 Mozart and Schikaneder took the idea that unsuccessful candidates for initation spend the rest of their unenlightened lives in subterranean captivity from Abbé Terrason’s 1731 novel Sethos, Life of an Egyptian King. Design by Karl Friedrich Schinkel. The Trials by Fire and Water. In Schinkel’s version Tamino and Pamina descend a long staircase on their way to the final rituals. Design by Karl Friedrich Schinkel. Sarastro’s Sun Temple. The opera concludes in an impressively monumental court. Couldn’t you use this set for an opera about the Conquistadores taking down the Aztecs...or one about the drowning of Atlantis? 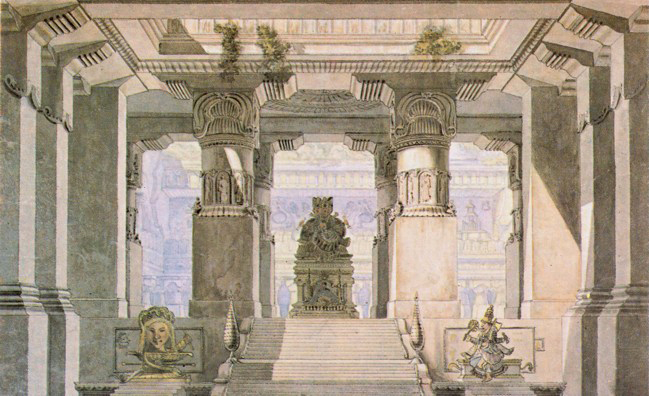 Design by Karl Friedrich Schinkel. 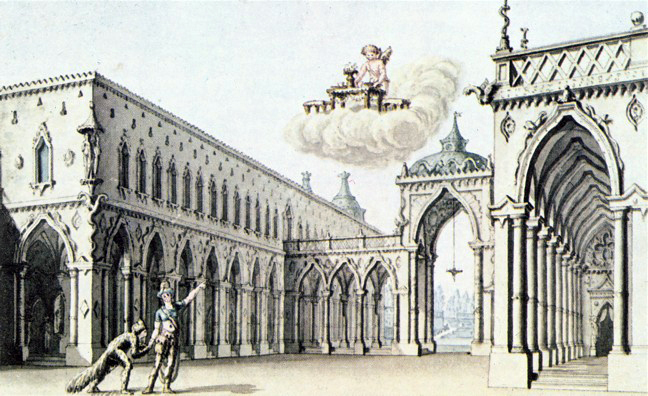 Magic Flute designs by Simon, son of the Joseph Quaglio who created the 1793 Munich production, show the influence of Schinkel’s production from up north. 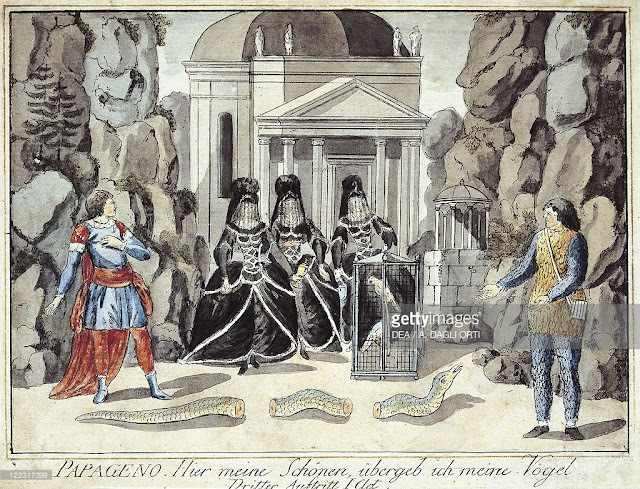 (The Quaglios were still active in Munich when Ludwig II gave the world premieres of Wagner’s Das Rheingold and Die Walküre in the late 1860s, very much against the composer’s wishes and aesthetic taste.) 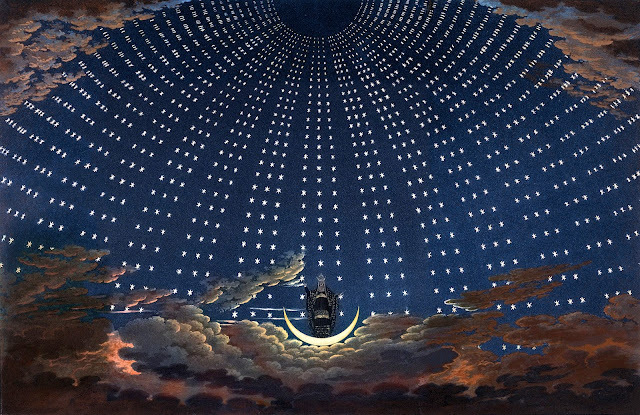 By now, designs for The Magic Flute start to reflect both the majesty and the mystery of this remarkable opera. The Queen of the Night. Could Goya have created a more haunting or Romantic image? 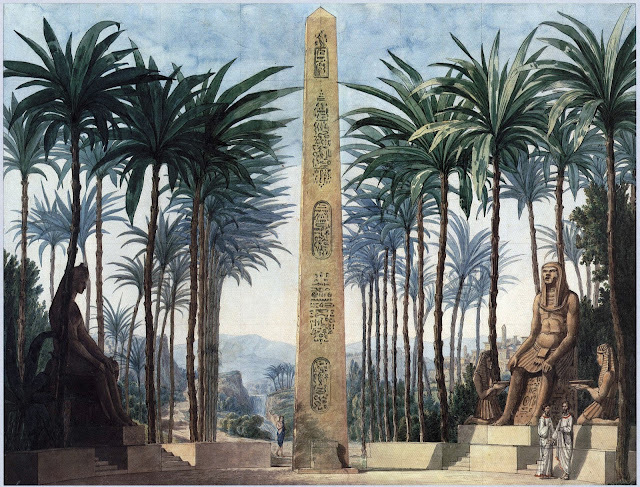 ...but Quaglio’s production also reflected the recent discoveries of the first Egyptologists. The Palm Grove. 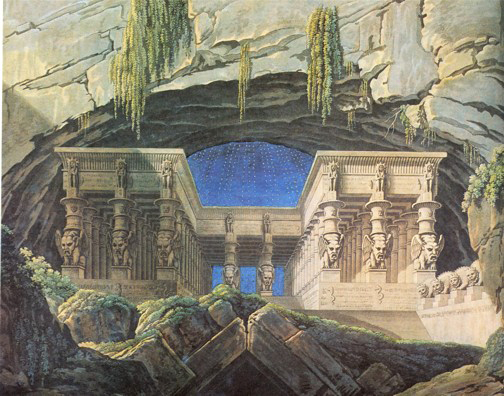 Quaglio’s response to Schinkel’s river-and-sphinx set is daringly Romantic in its use of landscape. 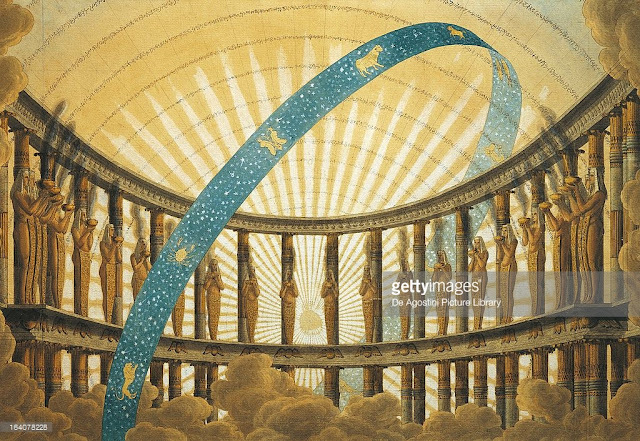 Sarastro’s Sun Temple features a starry blue band covered with Zodiacal signs arching across the heavens. Schinkel’s famous dome of stars for the Queen of the Night is starting to influence other theatrical scenery. 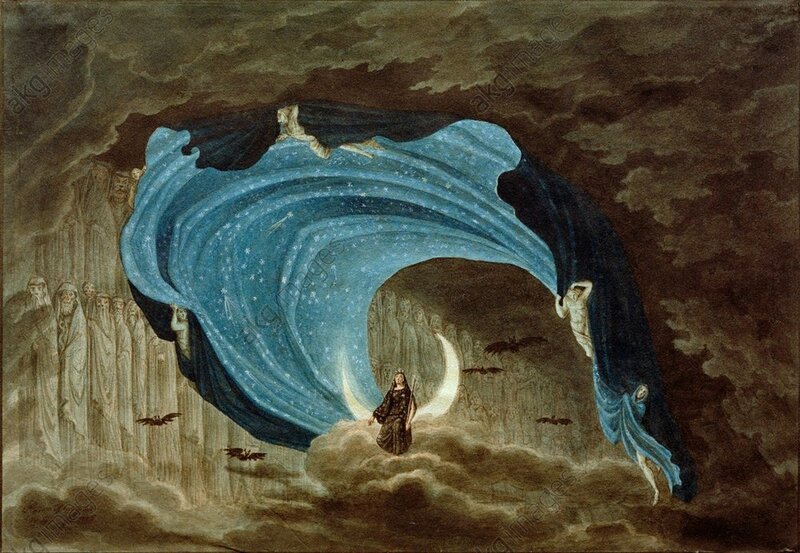 In addition to influencing the visual arts, The Magic Flute pointed the way forward to composers and writers. Goethe tried to write a sequel, although it was never completed. A more substantial literary response came from that rabid Mozart fan E.T.A. Hoffmann, whose novella The Golden Pot is not only his masterpiece, and one of the seminal texts of the Romantic movement, it’s obviously written entirely in response to The Magic Flute.